Kansas guard Lagerald Vick (24) pulls up for a three from the wing over Villanova guard Collin Gillespie (2) during the first half, Saturday, Dec. 15, 2018 at Allen Fieldhouse. No. 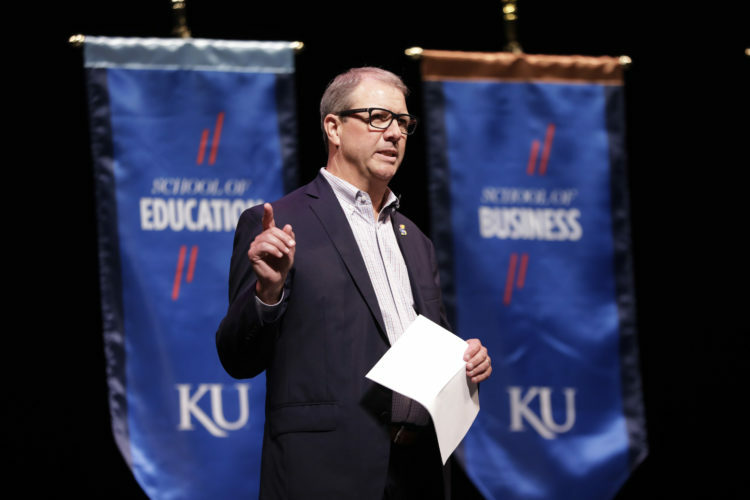 1 Kansas avenged last year’s season-ending loss to stay undefeated on the 2018-19 season. 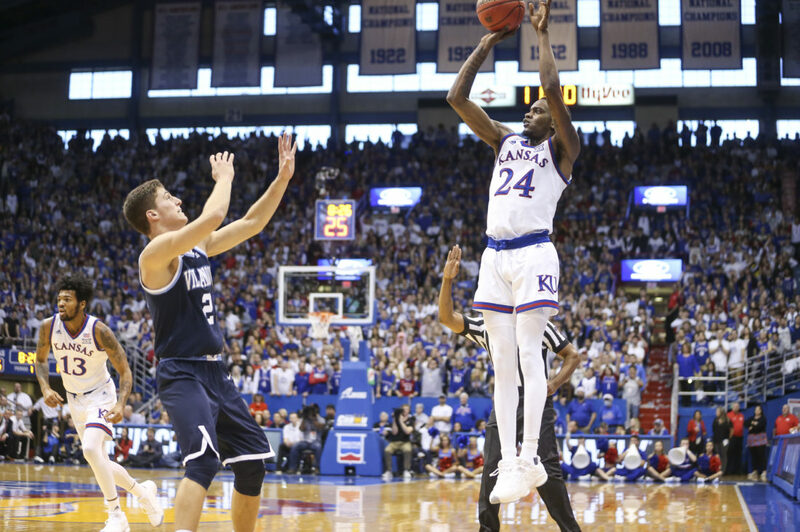 The much-anticipated rematch between KU and Villanova came down to the wire Saturday afternoon in Allen Fieldhouse. 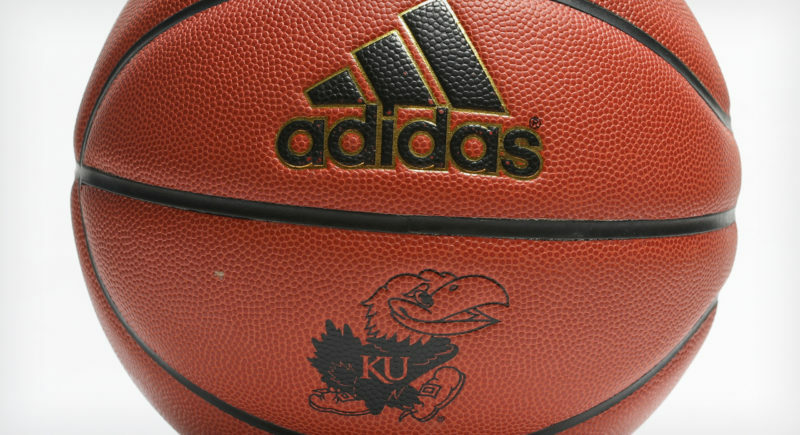 The Jayhawks made enough key plays down the stretch to claim a 74-71 victory over the defending national champion. Dedric Lawson and Lagerald Vick served as the one-two punch to lift Kansas to another hard-fought victory. The tandem combined for 57 of the team’s 74 points in the win. Lawson scored 28 points on 10-of-15 shooting, while Vick went 9-for-15 to finish with 29 points. With a win, KU (9-0) snapped a three-game skid against Villanova (8-4) and notched its fourth win in eight meetings in the all-time series. 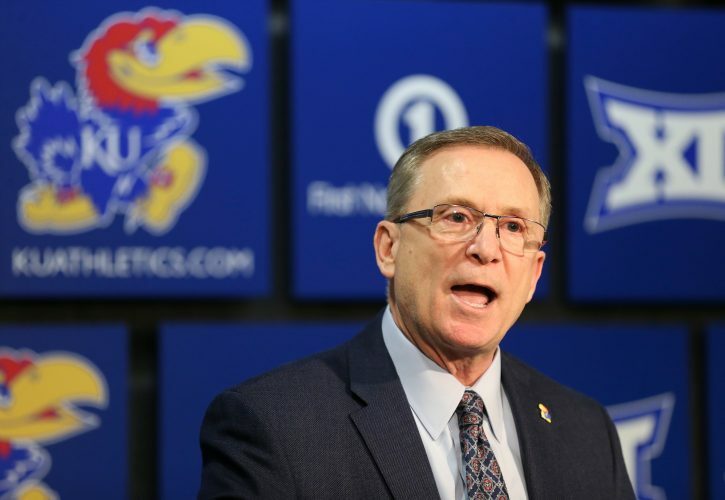 The Wildcats are the third ranked team that the Jayhawks have defeated to start the season. 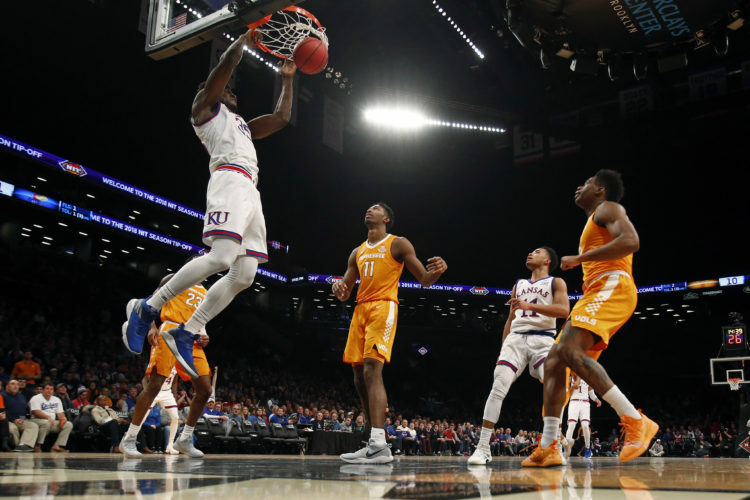 • The game turned when: Lagerald Vick displayed some sorcery midway through the second half. Vick has already made a number of ridiculous shots in Allen Fieldhouse this year. In a stretch during the second half, VIck took it to a whole new level with a trio of buckets. The first of which came on a drive when Vick wanted to pass the ball out, but changed his mind in the air. Vick netted the floater in transition, which was just the start of an impressive sequence by him. • Offensive highlight: The offense continued to run through Dedric Lawson Saturday. Lawson’s high usage rate leads to a greater chance of making significant plays in each game. After Villanova took the lead early in the second half, Lawson answered with a tremendous play to pull the Jayhawks within two points. After getting the ball on the high post, Lawson started to go left before spinning back to net a layup with his right hand. Even by Lawson’s standards, the spin was especially smooth during a strong season by the transfer from Memphis. • Defensive highlight: Kansas sophomore Marcus Garrett was just as important as Lawson and Vick for the Jayhawks. On two different occasions, Garrett swiped the ball away from a Villanova player and forced the ball to go off the opponent’s leg. Garrett was also essential as the team’s four, as his versatility helped when Villanova tried to run some ball-screen action with forwards on the perimeter. • Up next: Kansas will play host to South Dakota at 7 p.m. Tuesday.